- the theme for August's Four-In-Art reveal. polaroid blocks back in 2014. See that green and red heart up there? the inside cover caught my eye! and tentatively began quilting it. hoping things would go to plan! Isn't everything better with hand quilting? I do feel passionate about it! Thanks for a great theme, Betty! see their interpretation of this fabulous theme. Susan, I just love your favorite blocks married into such a happy piece - how original! And the hand quilting gives it an organic feel which says "I'm real". Clearly you're not afraid of purple and you embraced your passions - great job! This is lovely. You have had a wonderful play with this one. 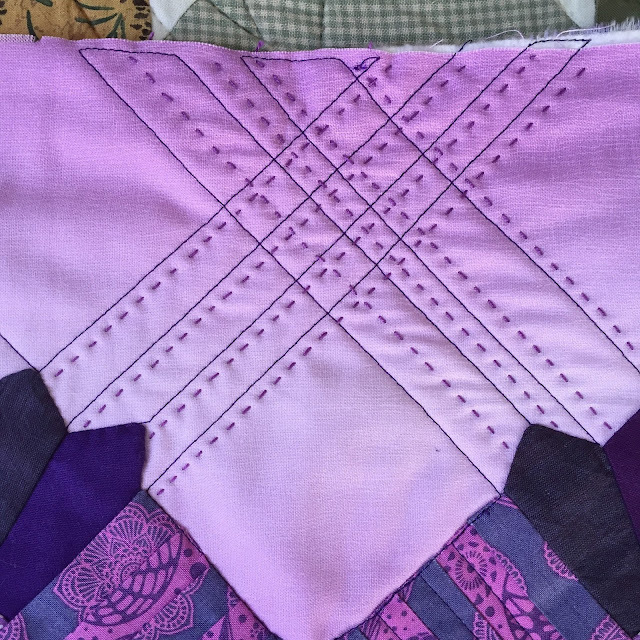 I really like the addition of the hand quilting. 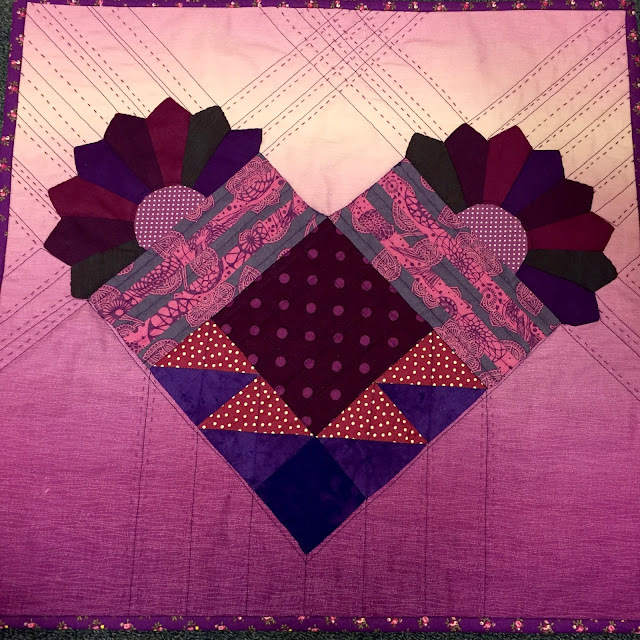 Love the addition of the hand quilting! Purple never looked better. The hand quilting is a wonderful addition too. I love that you found inspiration in an older book and brought new life to the concept. Well done. I can feel the passion. 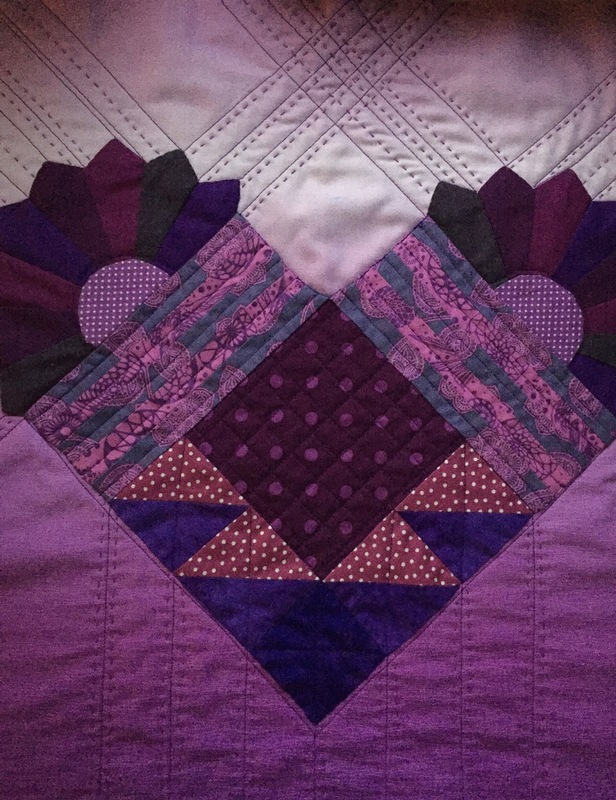 Love that you pulled in blocks that you loved, and combined traditional patchwork into an art quilt. I knew I spied some dresden blades the other day on IG! Beautifully done! 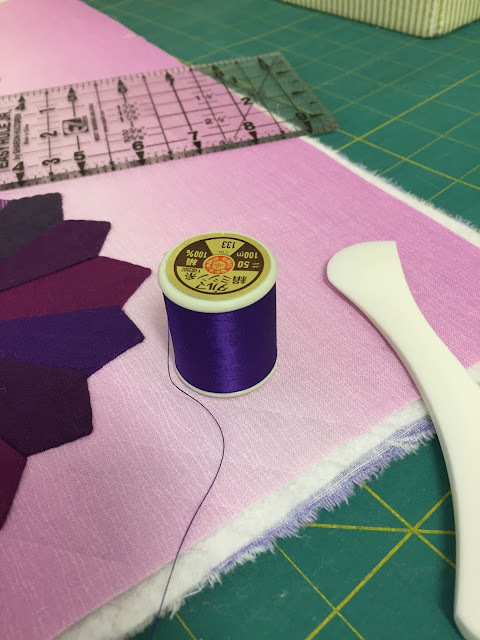 Wow - you have an awesome purple stash, there is a lot of inspiration in older books, they just require us to imagine the items made in modern fabrics, not the country toned ones they are usually in. What is your next colour going to be? That is lovely. I love how the quilting adds such a special element to the quilt. Nice job! Wow! This is a really clever interpretation of the theme. 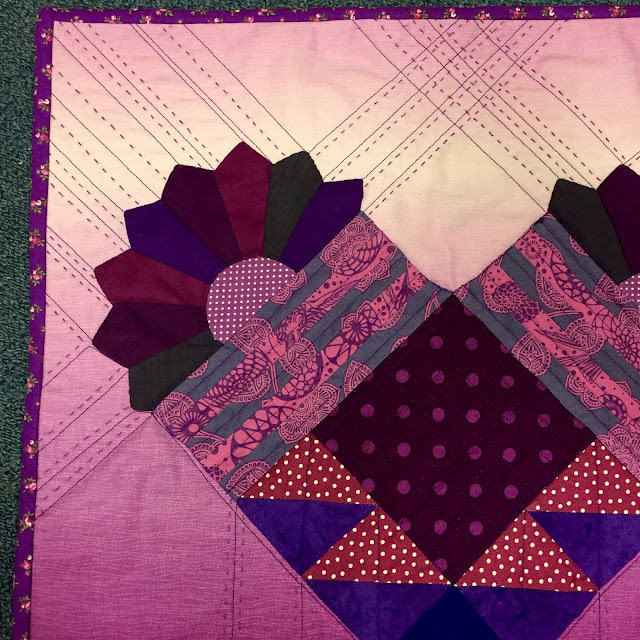 It's all so beautiful made with wonderful fabric choices and your hand quilting. Wow!~! That is an extraordinary quilt, with so many moving parts that all come together in one terrific whole. I love the Dresdens and the heart-shape and the whole thing backed up with an ombre fabric, the fading really working to highlight and "frame" the piece. Susan--you outdid yourself! So fabulous!! You have done a fantastic job of your purple quilt. All it takes is a little imagination to create something unique. Well done. A perfectly purple passion encapsulated! I especially like the hand quilting. 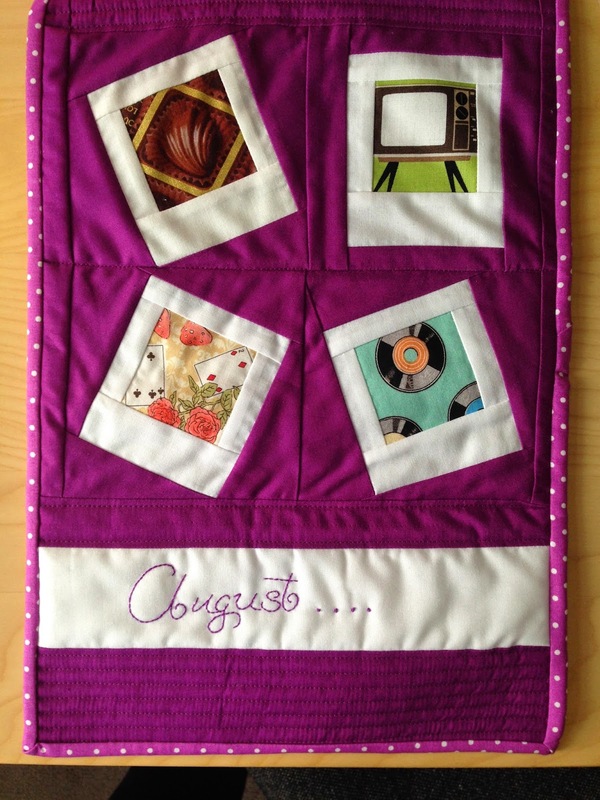 What a fabulous little quilt! Oh Man, I LOVE it. And you have some great purples in your stash!! This one is gorgeous! Your passion certainly shines through. Interesting to see how your creative process evolved... after all, who ever has a plan??? Wow, that's wonderful! 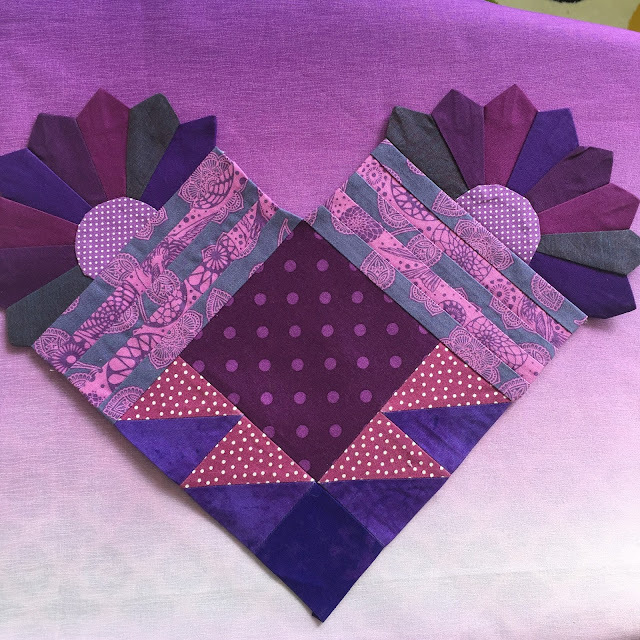 I love the Ombre background - a lovely little quilt!